What should I tell my workers’ compensation doctor following my workplace accident? If you suffered a workplace injury, it is important to get the medical care you need immediately so that you can recover from your injury and return to work. In Georgia, you must seek treatment from an “authorized treating physician” who is selected by your employer. It is important to understand what to tell him about your injury to obtain the medical treatment you need and to receive the workers’ comp benefits you deserve. This doctor will make a determination about your ability to return to work, which in turn affects your ability to receive temporary total disability benefits. This doctor will decide which, if any, specialists you need to treat your injury. The doctor can approve or disapprove light duty jobs for you, which can force you to return to work before you are really able to, and reduce the amount of workers’ comp benefits you receive. When you first see your workers’ compensation doctor, you will need to complete patient forms to provide him with a history of your injury. He will also obtain information from what you tell him and his staff during your appointment. It is extremely important that your medical history is accurate so that you receive the treatment you need and do not give the workers’ comp insurance company ammunition to deny your claim. They may look through your medical records carefully to try to find inconsistencies and use this to argue that you are not being honest or are not a credible witness in an effort to deny your claim. 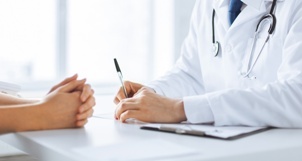 It is important to be honest and completely accurate when talking to your doctor about how your injury occurred, your symptoms, your level of pain, and all other matters regarding your injury. Do not exaggerate your symptoms or downplay them. Some workers make the mistake of only discussing the major injury that they are concerned about. However, it is important to discuss any symptoms, even if they seem minor. Some medical conditions, such as traumatic brain injury and back and spinal injuries, are not apparent right away. By discussing all of your injuries and symptoms, you may be able to receive treatment before the problem becomes more serious and avoid disputes as to the cause of your injury with the insurance company. It is important to keep your doctor informed of any changes in your level of pain, the location of your pain, and any new symptoms or injuries.